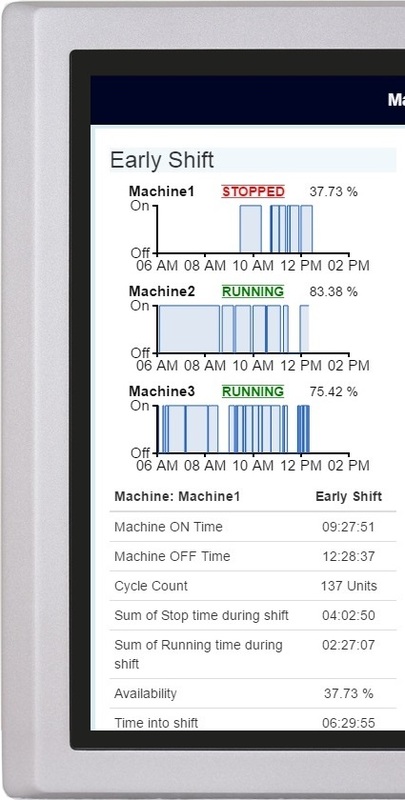 At a glance they want to see real time (and historical) productivity graphs, of machinery and factory floor employees – to drive efficiency improvements and subsequently, improve profitability. They need to move away from anecdotal evidence of issues preventing optimum efficiency and even have devices identify themselves as faulty or requiring servicing. To your right you can observe if our factory owner can improve the efficiency of each of his 3 identical machines to >98% – he can lose the third altogether, making vast savings. Their early shift suffers nearly double the ‘stop’ time than ‘running’ time – so it appears they have efficiency issues to address. Without this dashboard they’d never have known…or had proof. This all sounds like a lot of work (and cost) but it really isn’t. Even decades old machinery has buried internal signal lines, indicating power states, cycles, fault codes and many more. We just need to ‘hijack’ them..
1. We'll need to access the raw data. How? We piggyback existing signal lines within your machinery and direct their output to an Industrial I/O to WiFi/Ethernet blackbox, functioning as an “IoT Gateway” thus they instantly become network accessible. 2. We'll need to establish what it means. How? We observe the states of those signal lines in the conditions/machine states we wish to monitor (i.e. On/Off or ‘Cycle Complete’) and configure our ‘blackbox’ to recognise them. If those signal lines and states are already documented – even better! 3. We'll need to process the data. How? Our software running locally on a Panel PC, Industrial PC or your local server interprets (in real-time) that sensor data – both retaining the latest data and appending to log files to enable historical review of past states. 4. We'll want to see the data, and easily interpret it. How? 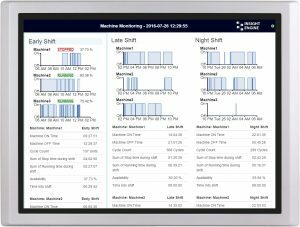 We create a customised dashboard (like that on your right) around those variables to provide real time (current) and historical monitoring to give you the data you need to drive efficiency improvements. This could be anything from direct machine data (completed cycles, on/off times, failure warnings, etc) to external sensors gathering environmental data (temperature, humidity) or any combination therein. The dashboard is presented via a Web server, so can be viewed on any authorised device within your internal network. You may want an industrial Panel PC within the production area, but also want to present the data in your boardroom on a projector. 5. We might want to control as well as monitor. How? Why stop at monitoring? By understanding machinery’s internal signalling, with the right configuration, you can centrally control them too! 6. Can't we then just push this to the cloud? Whilst you can give your dashboard a web-based IP address (rather than internal) so you can interact with it from anywhere in the world, even with a password it’s not the most secure. Cloud derived IoT solutions feature built-in security at every stage in hardware and software. If you’re monitoring data with low commercial sensitivity then a password may be enough – though we wouldn’t recommend allowing any kind of remote control from it! For more information about our local IoT services please get in touch with our projects teams on 01462 675530.